Vacuum motors are subjected to an immense amount of wear and tear. They will need proper maintenance to last any length of time. Even if you take good care of them they may typically only last around 60 days if you have a large carwash of 4 to 6 bays. Coin ones will usually only last not much more than 400 hours. Given this fact it is advisable to keep several machines on hand so that you do not lose money. Buying replacements: there are a number of varieties of Vacuum motors and you will need to know which ones will be suitable for your machines. Here are a few types to consider. By-Pass: this has a separate fan for cooling the engine. The air that gets sucked in with the cleaning process will bypass the engine. This product will be used for wet tank vacuums and floor scrubbers. They come in various sizes to fit different machines. Flow-Thru: this does not have a separate fan. Instead it will draw the air around the engine and use this to cool the engine. These Vacuum motors are used for machines that are being used for cleaning jobs that do not require water.?? Examples of these vacuum cleaners are dry tank vacuums and regular Hoovers. There are around 6 varieties to choose from. A+ motors are flow-thru types of engines that are available at cost effective prices. They are good for using at car washes for coin vacuums, which need replacing more frequently. Tips for prolonging the life of your Vacuum motors and making sure the machine is working well. Take care of the carbon brushes. These should be inspected at least every 2 months. If this is not done you will experience problems with the engine and premature failure. Make sure the engine is not loose. If this happens you will experience lack of suction power. You can check this out when you check the carbon brushes. Be sure that the hoses do not have holes as this will result in decreased suction and poor performance. Be careful to see whether the trap door is closed. Again if it is open it will decrease suction. Be sure the filter bag is not damaged or torn. This can result in debris getting on the engine and will decrease performance. It is very important to take care and maintain your Vacuum motors to prolong their life. It has been estimated that each machine can earn you around $400 per month. These vacuum cleaners are versatile and functional, as well as lightweight and portable. 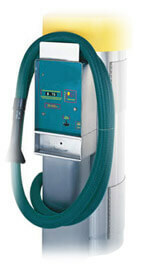 There are varying sizes ant types of carwash vacuum systems. Choose the right system for your cawash business.